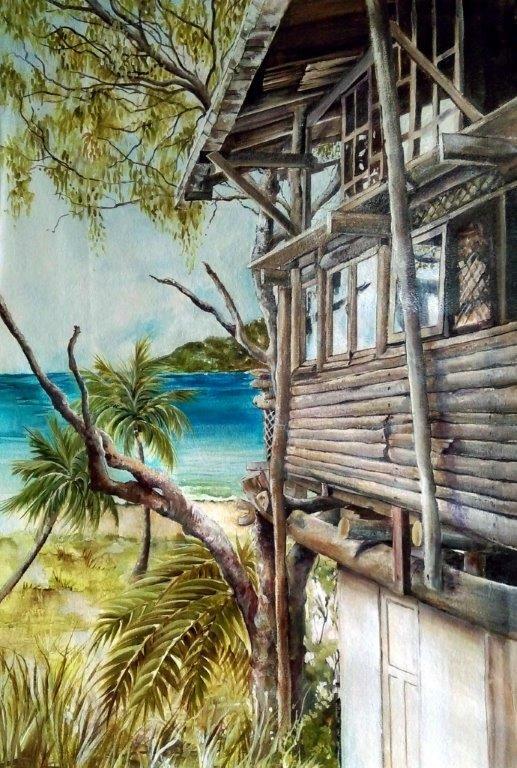 ‘Percy Tree House – Ocean View’ 65cm x 90cm is for sale $1200.00. 10% of the profit gifted to help support management of Middle Percy. An exciting fact has recently become apparent on Middle Percy Island, in that some of our heritage goats introduced to the Island by the Royal Navy in 1874 by Staff Commander Bedwell of the HM schooner ‘Pearl’ may have originated from India. There is a strong similarity to the Indian Black Nepal goat breed and we are waiting for the genetic tests to be completed. The ‘Pearl’ was given the mission of leaving goats and planting coconuts and other edible fruits from the Brisbane Botanical Gardens, to the islands, in order to provide food stocks for passing vessels plying the Queensland coast. European settlement was established two years later, in 1876, and the goats utilised by the Island residents to provide themselves and visitors meat, milk and skins for over 130 years. The first goat herd recorded as being domesticated was by Jimmy Joss, Mason and Smith. These men were rumoured to have been searching for gold on the Island but ended up bartering and selling produce to the passing vessels. They requested the first Government Leasehold of the Island in 1875 as they had built their home, gardens and animal paddocks behind the tidal lagoon at West Bay. Interestingly this was the lifestyle envisaged by Captain Mathew Flinders when he named the Island in 1802. In 1887 the Armitage family took over the Lease, as coffee growers, and had the Homestead built near the top of the Island, close to the water source. In 1921 the White family, from Canada via New Zealand, managed to “make a living off the sheeps’ back”. They cleared the land by ring-barking trees to make paddocks for 2,000 head of sheep, a few cattle and horses. The next permanent Island resident arrived in 1964, being my cousin Andrew Martin, when he purchased the remainder of the Pastoral Lease under the Lands Act. The sheep market declined, so Andy chose to manage the Rangeland goats and to again provide food and skins to the new breed of mariner; the cruising yachties and fishermen. He also started an apiary which has since proved its National importance, being far enough away from the mainland to be protected from contamination of destructive honey bee diseases. The Island is now under the Nature Conservation Act which has many categories of protection. Unfortunately the recently named ‘national park’ status of 83% of the Island prevents the goats from being recognised as a European Heritage animal. I understand that the lowly goat fed thousands of Australians in their developing years, and yet now they are now deemed as ‘feral’ and considered as pests! Like any animal, if it is kept at the appropriate carrying capacity, they can be an asset and not a problem. These animals keep the fuel load at a low risk, also providing meat, milk and skins. The Island visitors enjoy the famous goat stews as well as observing the goats in the wild. We need to find homes for these unique animals before they are all killed and their heritage destroyed by blinkered politicians. The other colours available in this Island breed are greys and browns. The Billies mainly have long hair, and the does mainly short hair, although the blacks tend to have hairy back legs!. They are of small stature; standing to my knee at their shoulder. They can produce twins and triplets under domestication; however in the wild only single kids are the norm. Please phone Cate on (07)49510993 if you would like a small herd of these lovely little animals. They make great pets if you want a milking doe with kid at foot that also keeps the vegetation under control. Tropical Cyclone Marcia made Landfall on 23rd February as a category five storm near Shoalwater Bay, between St Lawrence and Yeppoon, with wind gusts up to 250 kilometres per hour being recorded. We think it was category 4 when passing over Middle Percy Island between 12 midnight and 6am on Friday morning. Photos will be posted on the Gallery page. I would like to let people know the Island is still beautiful with more views than ever as one walks up the main 3.5km track. The short track is still blocked with uprooted trees and fallen branches and volunteers would be appreciated to help clear this 2km track. The water line to West Bay and the internal Island telephone line along this track, have been damaged, so these services are out of action, until visitors can aid us in sorting the problem. The Homestead area and orchard are littered with fallen branches and trees, so help would be appreciated to help tidy up this area. We are able to pick up helpers in the Ute, to transport them up to the Homestead, in order to help us clear up after Cyclone Marcia. The West Bay needs buckets and spades to help clear the sand from the Aframe, Tree House and Telephone Shed and to find and rehang some of the memorabilia. Many of the signs are still in situ and simply need dusting off. The cruisers online magazine www.thecoastalpassage.com has published an article about the Cyclone on page 10. A great publication with lots of interesting articles. Also our most recent West Bay ‘Tree House’ resident, Marty Pappay, has advertised his rain catcher in that edition; for those who like an easy way to collect fresh water when it rains. The Homestead telephone is working on 07 49510993 and the email contact is [email protected]. We also scan the Marine Channels and can chat on Channel 73. This artwork is symbolic of arriving at West Bay in fine weather and enjoying the ambiance of the Island from the boat at anchor. The famous Aframe ‘Percy Hilton’ is now the home of the recently formed ‘Percy Island Yacht Club’. This year the PIYC supporters are proudly displayed on a board donated by an inaugural member. Also all prints can be ordered as a stretched frame canvas (500mm x 750mm) ready to hang for $250 plus postage and packing; or quotes of measurements of your choice. An A4 laminated print is also available for $10 (plus postage). Jenni very generously gifts 10% of these sales to support the management of Middle Percy Island. There is a well sign-posted track which starts up on top of the rocky promontory between Whites Bay and Dolphin Beach up to the Homestead. The 2.5Km trail passes through wooded country and steep sections to the ‘main road’; turning left to the Homestead and right past the Hoop Pines of Mt. Armitage and towards the ‘airfield’ (not serviceable yet;- although any help offered to remedy that could be appreciated!) . The track is steep at the middle section, so you may need to stop here to enjoy the view on the rocky hillside (maybe communications will work up there, but only on Telstra systems). Once up the top of that track turn left to the Homestead (1Km) with a lovely view of South Percy at ‘Weather Station Hill’ (formerly known as’ ‘Dead Sheep Hill’ referring to the remnant sheep from the Whites flock, which grazed the Island between 1921-64) . Alternatively, turn right to explore the cool Hoop Pine forest at Mount Armitage and the grassy area overlooking Whites Bay with a wonderful view of North-East Percy (which looks like a giant floating on its back from this angle; one can then understand how legends arose). The varied vegetation is very different from the West Bay route and well worth the effort. So get those legs working with different muscles, and have a walk if you have time to spare. Refreshments and our famous Bush honey will also be available from the Homestead. For those folks who like to stay on the beach, try exploring between the central sand dunes to find the tranquil cool forest, smelling the Native Frangipani if in season. This is different to the Frangipani dubbed the ‘Percy island Frangipani’ by the Society for Growing Australian in 1989 which is on the West Bay to Homestead track above the Aframe area lining the road for 1km. The entrance to this beautiful forest is at the back of the sand-dunes near the centre of Whites Beach and is hidden between the dunes It is found by walking between the dunes lined with windblown Casurinas (stunted by the gale force SE’rly winds) and into the more protected area behind the dunes which grows wonderful Paperbark trees. Please remember to take drinking water (particularly if creek not running) and any personal applications and clothing to protect you on your adventurous safari. Check out the ‘mud maps’ for reference of walks and don’t blame me if you get lost or injured please. REMEMBER THAT you are on national park land until you enter the Regional Park area of the Homestead. 3) Giant Centipede nippers may all adversely effect you, so anti-histamine in your kit could be essential for some folks. The Royal Flying Doctor Kit is kept here and administration is available here on advise by the Doctor. We have a landline telephone or via the Marine Radio (you should reach Stanage Bay Coast Guard on 81 but maybe not the Homestead) . Please remember you are on the National Park zone at Whites Bay and are not allowed to camp.